Skills and Abilities: Highly trained hand to hand combatant, skilled marksman. Equipment: He owned a pair of gauntlets with which he could teleport a variety of guns to use in combat. He bragged he had one thousand at his disposal. He also has a teleportation device. Smithy was a member of the Assassin’s guild of New Orleans under the leadership of Belladonna, ex-wife of the X-men’s Gambit [Scarlet Spider #3]. After Kain/Scarlet Spider killed two individuals in breach of guild protocols and demanded Kain join their ranks, pay them a tithe or face the consequences and Kain chose the latter. His confrontation with the Scarlet Spider found both his hands broken. They were called off when he agreed to do one job for the guild [Scarlet Spider #4]. After the Guild had Kain try and assassinate Wolverine, the duo turned on and attacked them. 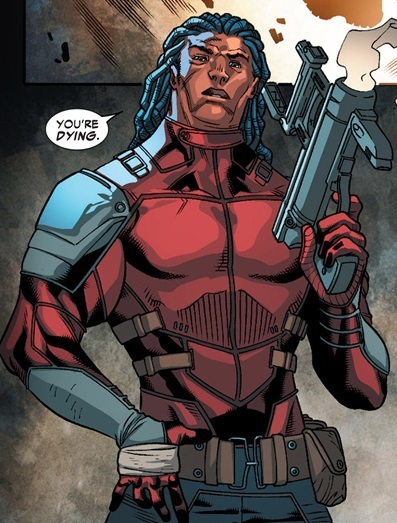 Smithy was later killed by a resurrected Candra [Scarlet Spider #18].